Don’t let the poster mislead you! TU Delft’s U-Lab comes up with a daring conference breaking from its single-disciplinary conservatism. During 3 days from September 24th on mathematicians, physicists, urbanists and designers gather in Delft. They will explore the implications of complexity theories of cities to planning and urban design. Besides hotshot professors Juval Portugali, Bill Hillier, and Mike Batty, gonna-be’s, or maybe wanna-be’s like Egbert and me will take the floor. The conference has a limited audience capacity, and is first-come, first served! For more information, you may see complexitytheoriesofcities.com, send an email to me and check out the other dates in our calendar of selected Rotterdam Architecture Events. Three decades of research have established the field of complexity theories of cities as a dominant approach to cities. Now that the field has come of age, it is time to stop for a moment, look back at what has been achieved, with appreciation, but also with sober criticism and then look forward at potentials that have yet to be realized. 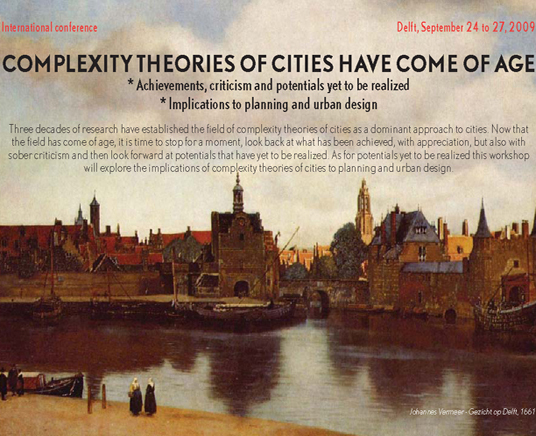 As for potentials yet to be realized, this conference will explore the implications of complexity theories of cities to planning and urban design. As examples to what we have in mind consider, firstly, Mike Batty’s (2008) recent observation that “In the past 25 years, our understanding of cities has slowly begun to reflect Jacobs’s message. Cities are no longer regarded as being disordered systems. Beneath the apparent chaos and diversity of physical form, there is strong order …”. Secondly, Portugali’s (2008) criticism that “in their search for statistical data to feed their models practitioners of USM tend to overlook the non-quantifiable urban phenomena” and as a consequence, some of the central questions of 21st Century cities and urbanism”. As for potentials yet to be realized we would like to emphasis in this workshop the implications of CTC to planning and urban design.